17 November: born in Zwolle, Netherlands (fig. 1), Philippus Jacobus Johannes Smit was the son of Jacobus Smit and Marie Clotilde Eleonore, née Courdy, of French origin (fig. 2). He was the youngest of five children of the couple to survive; his sisters were Elizabeth, nicknamed Lize or Lisa (*1874), Leonore (*1875), Clotilde (*1877) and Emma (*1885) (fig. 3). One brother, who was born in 1880 and died in 1883, had the same name as him. A second brother, Johannes (*1882), and a sister Jacoba (*1892), died shortly after their birth. Some official documents including his last passport and death certificate, erroneously record that he was born in 1887. Philippe benefits from a French education, his father works as a hairdresser. 1. 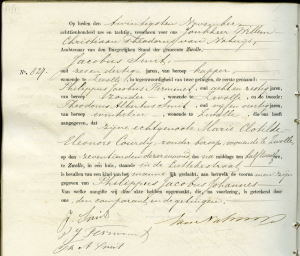 Extract of registration, 7 August 1895. 1. 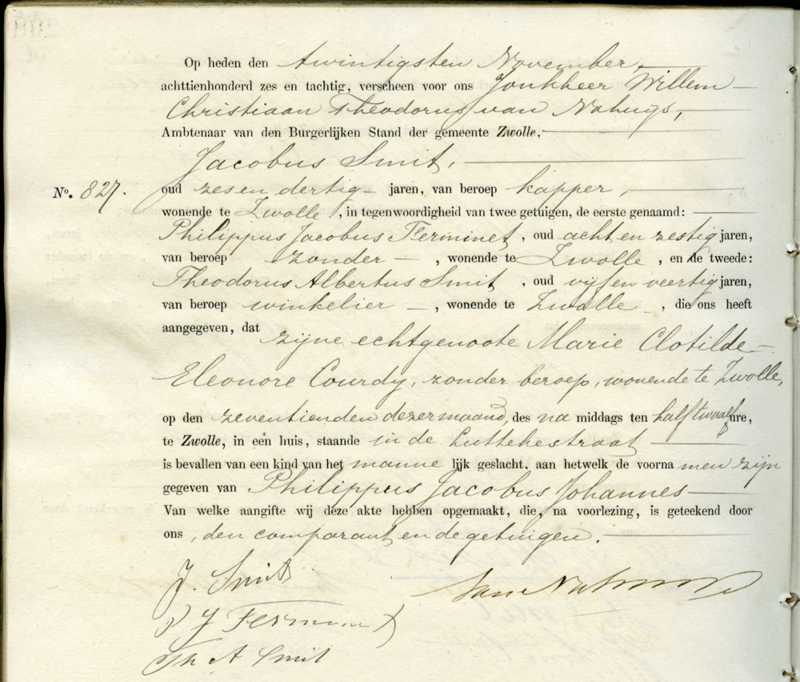 Official document of the Dutch military authority. 2. Philippe Smit always believed that he became bold at an early age because of this activity as a jewler who worked under a very strong light (anecdote told by Miriam Pitcairn): see “Unpublished interview of Miriam Pitcairn-Mitchell” by Jonathan D. Kline, Bryn Athyn, 7 March 1994, 16 typewritten pages, p. 8, Glencairn archives). 2. Except from Miriam Pitcairn-Mitchell’s unpublished interview with her son Lorenzo Mitchell (taped between 1992-2002 and transcribed at a later date, p. 19, private archives, Paris) we do not have any other information about the date when they first met. 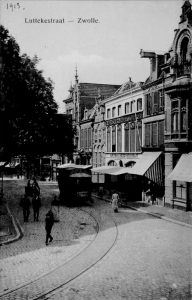 On 19 May 1905 the Urbans leave Amsterdam for Bussum (Huizerweg puis Ruthardlaan) where they live until 1912. 1. See biographical note on Ernst Pfeiffer and interview with Miriam Pitcairn-Mitchell and Lorenzo Mitchell (op. cit., p.20). Attends in Paris two drawing schools: the “Académie” in rue Etienne Marcel and the school of Adolphe Gery-Bichard, engraver-painter, in rue Montgolfier. Here he meets René Massé who becomes a life-long friend. Although the exact dates on which Smit attended the schools are unknown, his correspondence with Massé begins in 1910 which suggests that Smit started school about the same time.1 Smit leaves the paternal home to live in a small room rue Malte Brun in the 20e arrondissement, at the same address as René Massé. 1. Massé named the schools in his diary: “He spoke of our dear Comrade Beauvisage, who had a fine talent as a painter, and whom we knew at the Academy rue Etienne Marcel before the war of 1914-1918. I handed over to Philippe the photograph of Géry-Richard, Peintre-Graveur, who was our teacher at the evening drawing lessons in rue Montgolfier.” (Massé 1920-1935, p. ). 2. See Massé album, p. [2-4]. 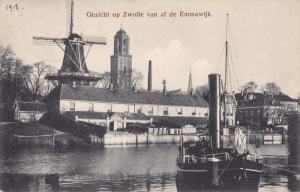 Several visits to Holland until the war. A time of extreme destitution for the artist. 1. PS, APCS to the Massés, Vétheuil, [7 September 1911] (filed under the wrong date 20 October 1911), Massé album, p. ). 2. See Massé album, p. [6-8]. 1. PS, ALS to the Massés, Barbizon, [1912, most probably in winter/spring], Massé album, p. . 2. Le Matin, Paris, 15 June 1912, p. 4. 3. PS, APCS to the Massés, s’Gravenhage, [22 June 1912], Massé album, p. . 4. Jacobus Smit, ALS to Massé, The Hague, 2 October 1912, Massé album, p. . 5. PS, ALS to Massé, 18 October 1912, Massé album, p 15]. 6. PS, ALS to Massé, [end 1912], Massé album, p. .
August – October: spends several months in Holland staying with the Urbans in Hilversum4: he travels to Amsterdam where he enjoys the city’s cultural life; goes on short trips to the Zuiderzee region; staying in Naarden with peasants he is very upset about the bad weather which prevents him from making progress in his work but is in love with this beautiful and wild nature there; in Zwolle he evokes his childhood. Autumn: goes for walks in the forrest of Fontainebleau and in Barbizon. End of the year: returns to Paris. 1. See [PS 62]. 2. See Philippe Smit 1913, see also [PS 14] and [PS 78]. 3. PS, CAS to his father, [10 January 1913] and see [PS 14]. 4. 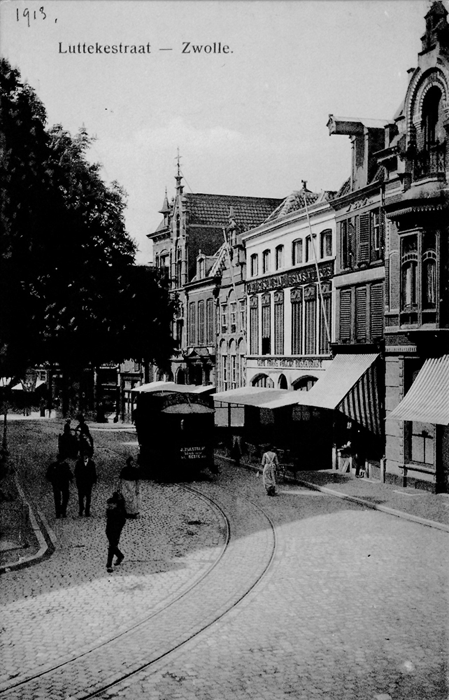 On 1 October 1912 the Urbans leave Bussum for Hilversum. 5. PS, ALS to the Massés, Amsterdam, 29 August 1913, Massé album, p. . 6. PS, ALS to Massé, , Massé album, p. . 7. 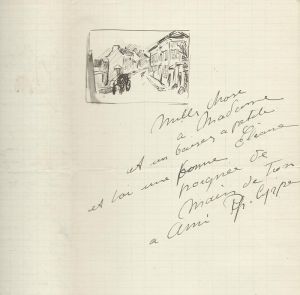 PS, ALS to the Massés, Amsterdam, [10 September 1913], Massé album, p.  and see [PS 76]. 8. PS, ALS to the Massés, Zwolle, [6 October 1913], Massé album, p. . FIG. 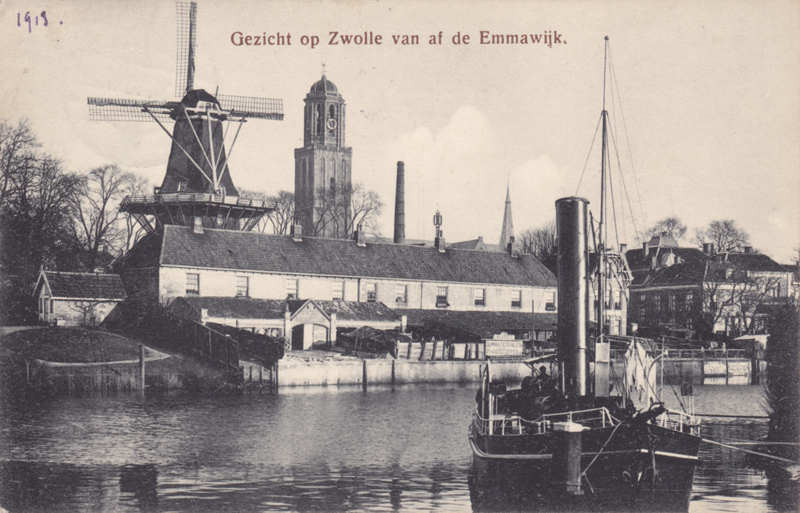 1 Zwolle, PS, postcard to his friend René Massé, 1913.
archief Historisch Centrum Overijssel, NL. FIG. 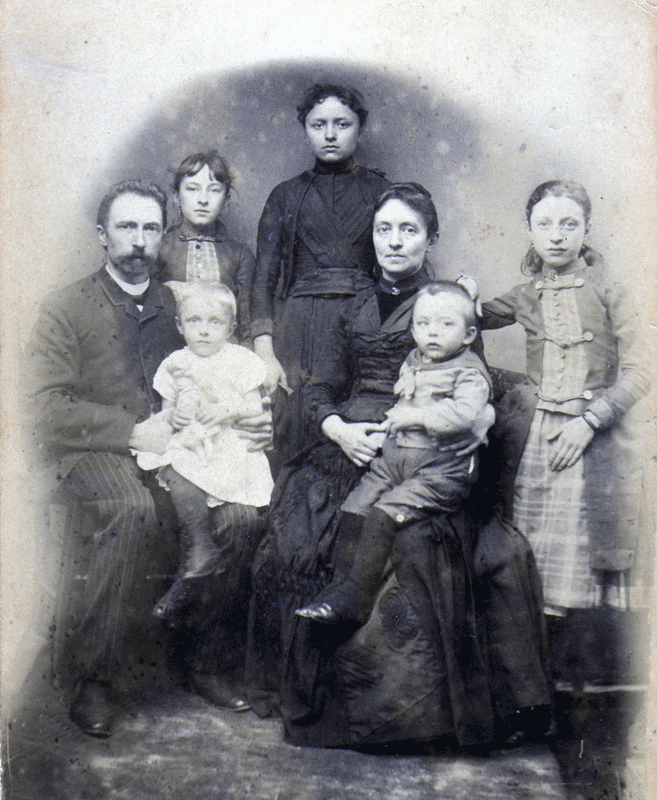 3 La famille Smit, vers 1889, Philippe seated on his mother’s lap. FIG. 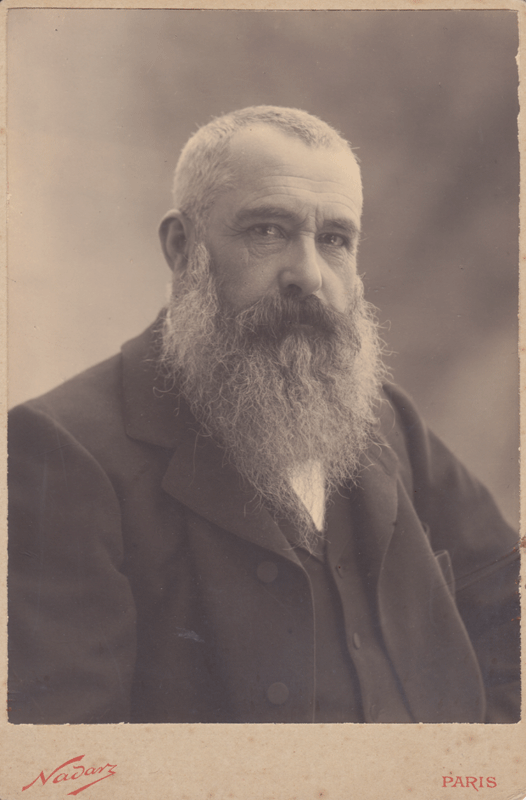 4 Claude Monet, 1899, photo Nadar, former collection of the artist. FIG. 5 Sketch of the street appearing at the end of his letter.